Hyundai Motors India pulls the collar up with an increasing demand of the automatic variant of Creta. As the vehicle was first unveiled on 21st of July 2015, it got much appreciation and attention by the SUV lovers and car enthusiasts. The popularity can be seen in the fact that the car managed to garner about 10,000 bookings before its official launch. However, the automatic variant is gaining popularity over the manual one and is preferred by the masses. With the launch of Hyundai Creta, many other car makers seem to offer heavy discounts on their products in the same segment to lure the buyers. Recently, Maruti offered the benefits of up to INR 1 lac and the same thing happened with Renault. Further, Creta by its mesmerizing looks influenced the buyers and attracted many getting them away from Scorpio and XUV500. The vehicle competes against the likes of Ford EcoSport, Renault Duster and Maruti S-Cross in the segment. From the day it was introduced, the car has received an overwhelming response from the buyers. One of the many reasons that help the vehicle become so popular among the Indian masses are the reasonable price and a smart design with influential looks that drew the buyer’s attention. 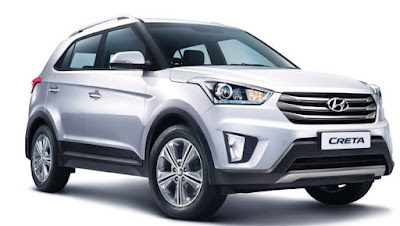 Hyundai Creta is available between a price tag of INR 8.59 lac and INR 13.60 lac (Ex-Showroom Delhi). Seeing the increasing demand of the Creta, the Korean car maker has increased the production of the vehicle. The company now produces from 5000 units to 6500 units every month, that is achieved in a time period of just 2 months. On the design part, Creta flaunts stunning outer body. It gets bold radiator grille with triple slat chrome finish on the front. Headlight cluster gets swept back design and it comes with bi-functional projector headlamps with LED lights. The bumper gets a muscular appeal and incorporates large air intake sections. Further, it receives vertically positioned fog lamps. At the rear end, it gets tail light cluster and rear bumper while the rear windscreen looks small. The license plate is done in chrome and is placed above the bumper. On the dimensional front, it features length of 4270 mm, width of 1780 mm, a height of 1630 mm and a wheelbase of 2590mm. As per the interiors, the new Hyundai Creta is home to attractive and spacious cabin. It is decorated with dual tone color scheme that is black and beige. The steering wheel, seat covers, door armrests and gear shift knob are wrapped with leather. The dashboard gets the edgy design and looks very attractive while it also receives infotainment unit with high-resolution screen. Other important features in the Creta are air conditioning unit, height adjustable driver seat, MT shift indicator, keyless entry among others, that has made this a hearthrob in a short span of time. Hyundai Creta has been introduced in a total of 6 variants; Base, S, S Plus, SX, SX Plus and SX. Mechanically, Hyundai Creta is offered with three different powertrains. The mid and base variant is powered by 1.4 litre CRDi engine that can deliver the power output of 88.7 bhp at 4000 rpm and a peak torque of 219.7 Nm between 1500-2750 rpm. Another one is a 1.6-litre engine that is capable of producing the power output of 126.3 bhp at 4000 rpm and a torque of 259.8 Nm max in the range of 1900-2750 rpm. On the other hand, its petrol variant is powered by 1.6 litres VTVT mill that can churn out the power of 121.3 bhp at 6400 rpm and a torque of 154.9 Nm at 4850 rpm. All the mills come coupled with the 6-speed manual transmission with front wheel drive, while its top variant SX Plus gets 1.6-litre diesel motor that is mated to 6-speed automatic gearbox. ARAI certified fuel efficiency of 1.6 petrol is 15.29 kmpl, for 1.4-litre diesel it is 21.38 kmpl and for 1.6-litre diesel it is 19.67 kmpl for manual and 17.01 kmpl for automatic variant. Looking at the ongoing upsurge, without an iota of doubt we can say this new offering from Hyundai has already conquered the segment.